Brethren of the Coast is a game that I remember reading about a few years back – it was the winner of the 2012 Hippodice competition – but then it drifted out of sight. I was pleasantly surprised to learn that it has been published by uplay.it. Though I was not contacted about it until last month, the tin has a copyright date of 2015. In this game, players are competing pirates in the Caribbean, working both together and competitively to steal Spanish gold. The setup is simple – each player gets a set of ships (3 big, 9 small). 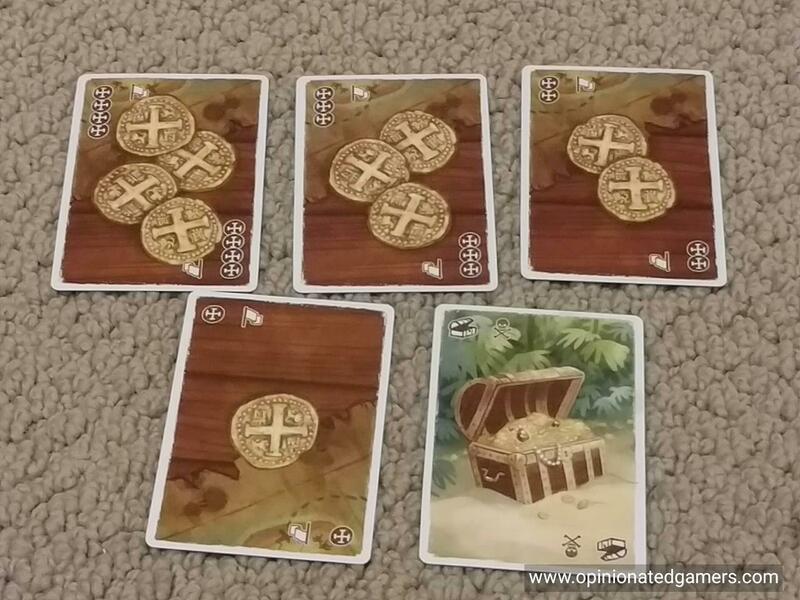 There are double sided cards which start out as Spanish Galleons and later switch to islands. One per player is set up in a circle. A player aid card representing Port Royal is placed in the middle. Finally, there is a deck of cards which is modified for the number of players – this is shuffled, four cards are removed at random to prevent card counting, and then each player is dealt a hand of four cards. Finally, each player starts with four doubloons. At the end of the game, the player with the most doubloons is the winner. The game is played over 12 rounds. In each round, players first play a ship to the board and then they play a card to the board. 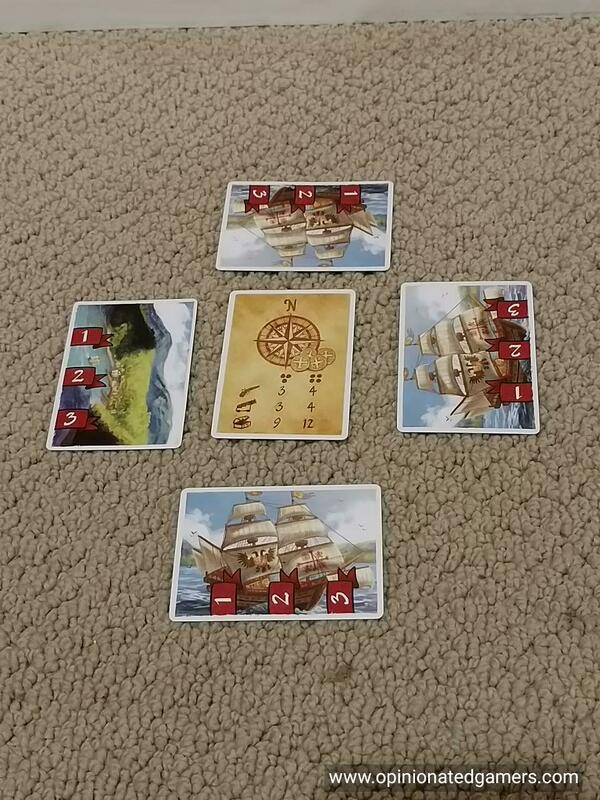 At the end of the game, all the ships will be played and all of the cards in the deck will also be played. On each of the Spanish cards (regardless of the side), there are three numbered spaces. Ships played by players will line up on these spaces in order of strength. The big ships are worth 3 masts and the little ship is worth 2 masts. As ships get played, the total number of masts of each color are compared with the highest total being placed in the #1 slot, etc. In the first phase of any turn, the active player places a ship of his color (either size) next to one of the cards – then he reorders all the fleets there in terms of size. The rules are unclear what to do with the 4th, 5th and 6th size fleets. They rules say to place them to the side of the smallest fleet and keep them in order. If there are ties for fleet size, the fleet already ahead stays ahead. Then, the player looks at his hand and plays a card. This card may NOT be played where the player placed his ship this turn. In general, cards are played face up next to one of the Spanish cards. However, the player can choose to play their card facedown – though there is a cost of one doubloon token to do this. Any doubloon tokens spent this way are placed on the Port Royal card in the center of the table. Note that you can only use the doubloon tokens given to you at the start of the game for this – you cannot use doubloon cards taken as booty! If the Spanish card is still on the ship side, a scoring will be triggered as soon as the sixth card is played next to that ship (more on scoring later). Marked Doubloons – these special cards are earmarked for fleets in the #1, #2 or #3 positions. Each card in the game is scored twice. In setup, they all started on the galleon side. The galleons score immediately when the sixth card is played on them, at which point they are cleared of cards and ships and flipped over to the island side. The island sides can have an unlimited number of cards played to them, and they will all score at the end of the game. In either case, scoring follows the same procedure. First, you deal with the cannons. If there are multiple cannons (any number 2 or greater), they all misfire and nothing happens. If there is a single cannon, it attacks the strongest fleet – the one in #1 position – and reduces it to its single smallest ship. You will likely need to reorder the ships after the attack. Second, the muskets fire. Again, if there are multiple muskets, they all misfire and nothing happens. If there is a single musket, it attacks the “fleet in the lowest occupied position”. The rules are super unclear about what this means, so we have chosen to use the fleet in the #3 position. That fleet loses is smallest single ship. Again, re-order if needed. Third, any marked doubloon cards are distributed to the players in the matching positions. If a position is unoccupied, the #1 fleet gets the card for the unoccupied position. Fourth, the doubloons and treasure chests are distributed. Starting with the player in the #1 position and then going down in fleet size order, each player chooses one of the available cards. If everyone has chosen a card, start again with the #1 player. 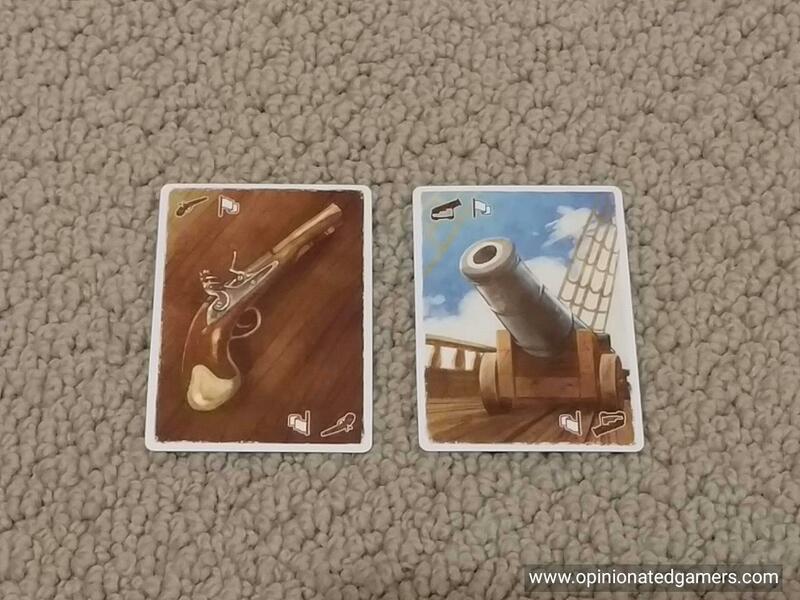 The game ends when all the ships and cards have been played. The Spanish island cards are now all scored, going in clockwise order around the table. After the islands have been scored, then it’s time to settle up the treasure chests. If there is a player with more treasure chests than any other player, that person gets the Port Royal card which is worth 4 doubloons. Finally, all of the doubloon tokens that had been spent during the course of the game to hide cards are split up. Half go to the player with the most chests (rounded up), half go to the player with second most chests (rounded down). The player with the most doubloons wins! Ties go to the player with the most treasure chests. 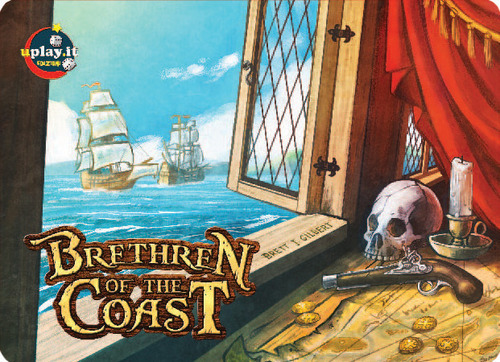 Brethren of the Coast is a nice light game with some room for bluffing and nice tactical play. 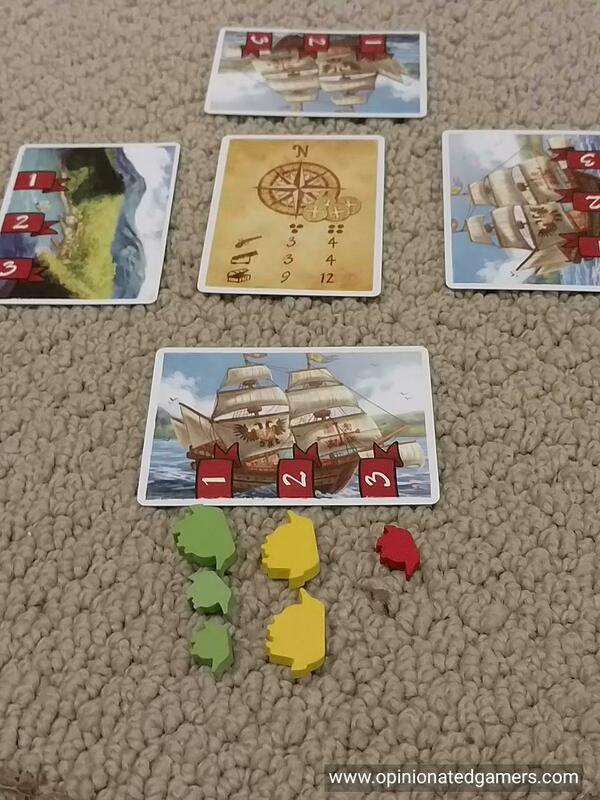 The mechanism are super easy – place a ship, place a card, next player. Yet, despite the simplicity of the game, it’s a tricky thing to do well. Like any card game, you’re going to be at the mercy of the cards in your hand – and you just have to make the best of it. Each turn, you will get to affect two locations, one with a ship and one with a card – and though you’d really like to place both things at a single site, you’re not allowed. Trying to disguise your intentions is a hard thing to do, though you do get a chance to play some of your cards facedown to confuse your opponents. Perhaps you are bluffing about playing a cannon card or not; or maybe you put a valuable marked doubloon card there, and you are going to use your insider information for a big payoff. You also need to figure out how to budget your ships. You could choose to use them early and try to guarantee a nice score at the galleons. You know that there will be a guaranteed six cards at each of those sites – there is no guarantee that the Island side will have as many cards… Though, if you save your big ships for the end, you can make big moves on the islands that have plenty of cards! It’s easier to maneuver your ships to a high scoring Island because there is no limit on the number of cards played at that location. The components are well done, and the game comes in an attractive tin. I myself do not like games in tins as they don’t stack well in the game shelves, but I know plenty of people that prefer this sort of packaging. The rules are fairly easy to grasp, though there are a few areas which I feel need clarification – such as what to do with smaller fleets, and determining the targets of the musket cards. As long as the group agrees on rulings for these situations at the start, the game will be fine – but it would have been better for the rules to be clearer to prevent confusion/conflict. Our games have been coming in around 30 minutes, and that feels right for this game on the lighter end of the spectrum. Andrea “Liga” Ligabue: I found this game much more enjoying that I was expected just reading the rules. It is a game for people liking a little chaotic interaction, with bluff and twists. With just 3 players you have a quite good control of what’s happening and the game is a bit more strategic than with 4 or more player where intuition is usually more useful than strategy. The possibility of place face-down cards is actually the real strong point of the game. I like this game: it is a nice filler both for families and gamers.